Kitchen Exhaust Hood Cleaning in Lakewood CA | Flue Steam Inc. If you own or operate a commercial kitchen, kitchen exhaust hood cleaning in Lakewood CA is a fact of life. You need to make sure you get frequent and thorough cleanings in order to comply with your fire safety code obligations and to reduce the risk of a fire in your exhaust system. Flue Steam can help with every step of this process. What is Kitchen Exhaust Hood Cleaning in Lakewood CA? Kitchen exhaust hood cleaning in Lakewood CA is the process of removing the greasy buildup that accumulates on your range hood during cooking. 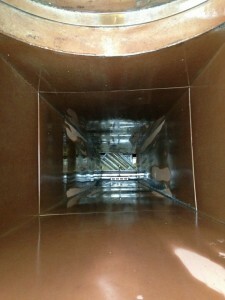 The most common way of cleaning a range hood is with hand-scraping. One of our licensed technicians can simply scrape away that dangerous greasy buildup until the deposits are down to the 0.002” thickness deemed safe by the relevant fire safety codes. The cleaning should be repeated as frequently as necessary, in order to prevent grease from ever accumulating in a layer thicker than 0.125”.